That’s how I used to call myself when I were in junior high school. “Ami” is my nick name in my family,,, n’ I Did love to read and watch Sailormoon’s series. I love blue color just like Ami. 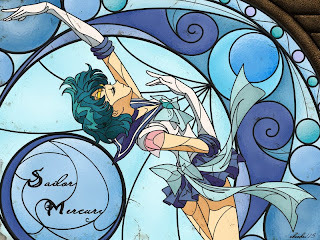 I love the Mercury planet just like Ami. I love to play chess, I love to swim, I love to read, I wear glasses, I love music and even play Electone, Piano and guitar for myself and I’m 14 years old just like Ami Mizuno. I’m shy and I don’t make friends very easy… I don’t have any boy to be loved. And I’m always dream of being a princess like Ami. It’s even better when I entered Muthahhari Senior High School in Bandung. That making-friend-things are gettin me crazy…It’s not easy tough…but I finally made it. I even got myself involved in the “BMR-13” gang. Time’s changing, n’ I found myself in grade 3rd, the last grade. And I’m starting to think about my future. Weirdly, I found myself wandering on a destiny in studying Medical in German (because there’re a lot of Muthahhari’s student ended up studying in German)..OMG…this is exactly JUST LIKE AMI! And just like Ami, I didn’t go to German. But stay here in Indonesia, studying medical in Hasanuddin University. My nick name here is “Ame’”…I got many friends…I fell in love with a great man (though now he’s gone)…I enjoy many extracurricular…I never swim, or play chess again… I got a long hair,..I got bored easily, I stopped playing Piano, Electone, and guitar. Instead of listening to those classical music from Mozart, Bach, and Richard Clayderman…I’d prefer pop and latest hits music. I looked closer…n’ realizing that this….is…just like my old hair when I was In junior high school! This is the hair cutting of Ami Mizuno! Let me scream it once again….